Earning the best-in-class for fuel efficiency, the G280 consumes 12% less fuel than other super midsize jets. Along with reduced emissions, this jet has longer maintenance intervals allowing for less time on the ground and more time in the air. One of the big differences between the G200 and its successor is the G280’s tail and wings. The new aircraft has a high T-tail rather than a cruciform tail. The G280’s wings are also larger and sleeker, allowing for reduced drag and enhanced lift during takeoff. The upgraded wings, tail, and powerful engines increase the speed and range of the jet. Two Honeywell engines each deliver 7,624 pounds of thrust. The jet has the ability to climb to 43,000ft in less than 23 minutes and has a maximum speed of 0.85 mach. At a speed of 0.80 mach, the G280 can fly eight hours nonstop; the only aircraft in its class capable of flying uninterrupted from London to New York. A luxurious white leather interior decorates the cabin which has 19 windows, providing a well-lit and appealing environment. The door to the airplane has a six-foot clearance and the cabin is over six feet in height, giving travelers extra space and coziness. Able to seat up to 10 and sleep up to 5, the G280 has three possible floor plans that travelers can configure to meet their needs. 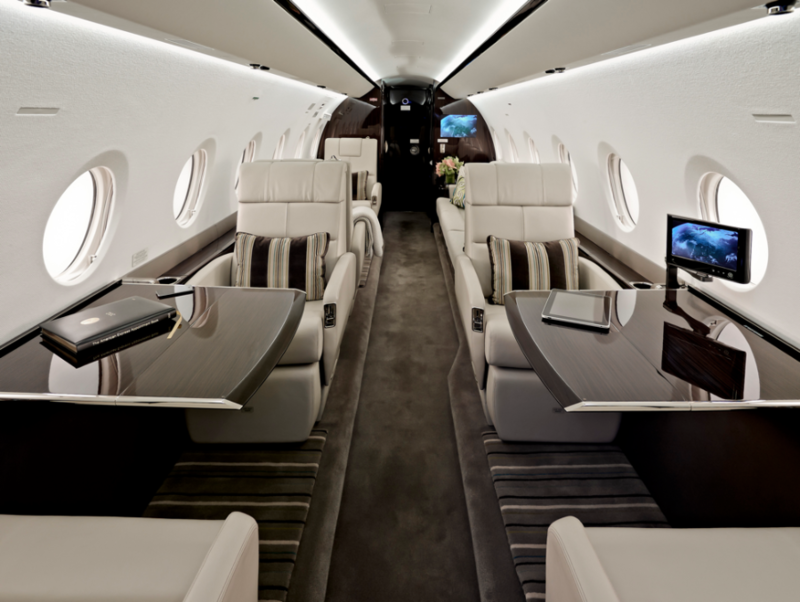 The Gulfstream Cabin Management System allows passengers to access and manage cabin temperature, lighting, HD monitors, and entertainment all from an iPod touch. 100% fresh air circulation, decreased noise levels, and a low altitude cabin make for a relaxing journey. Passengers can also track the flight’s progress at any time. A satellite phone is available to keep connected, and Gulfstream offers the option of high speed internet as well. Dual Blu-ray DVD players allow travelers to play their favorite movies or TV shows inflight. The G280 has supreme avionics technology, as well as excellent handling qualities. Aircraft control and handling is increased by state of the art flight and navigation systems. 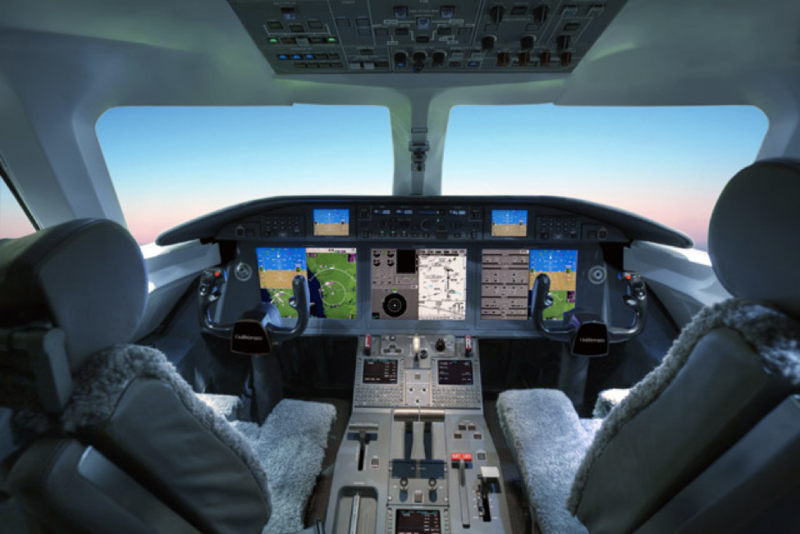 Gulfstream’s PlaneView280 flight deck has three large displays that help to increase situational awareness and planning for pilots. In addition, the flight deck is equipped with Enhanced Vision System and Head-Up Display, giving pilots the ability to see terrain, runways, and any obstructions during low visibility conditions. The G280 has the capability to depart from shorter airfields for long range trips than most super midsize aircrafts. The jet can also land in weather conditions that would otherwise be prohibited for unfit aircraft. The G280 was meant to save time with its long range capability and efficiency. Its sporty and impressive performance means passengers will arrive at their destination faster than ever before, feeling relaxed and ready for the next journey.